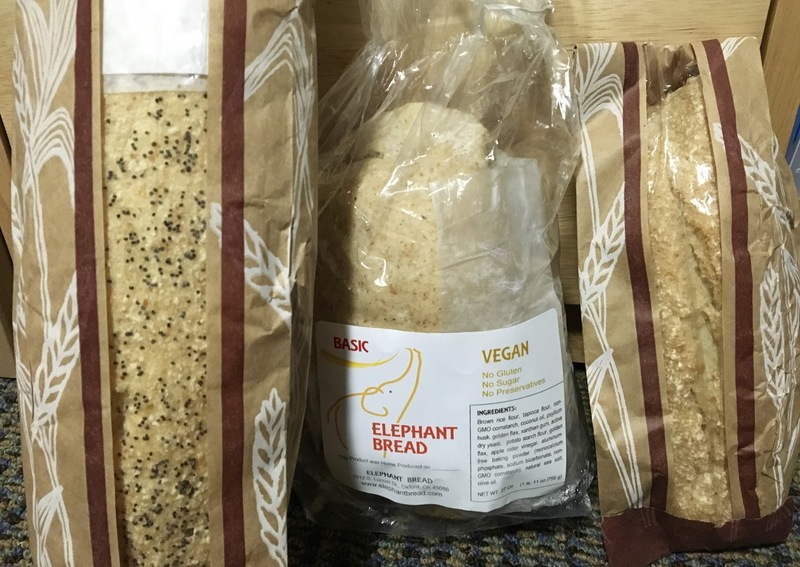 Elephant Bread is the product of founder Mary Glasmeier's quest to make top notch gluten-free bread after her daughter was diagnosed with celiac disease. Her journey to develop the bread has taken resilience and hard work, but a couple years in now, she has acquired quite a following from gluten-free and non-gluten-free folks alike. 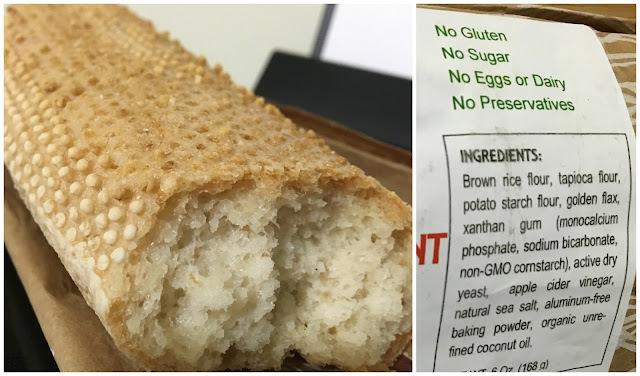 I was floored when I stopped by the Elephant Bread booth at the Gluten-Free for Cincinnati Expo because gluten-free baguettes are a relative rarity still in the gluten-free world no matter how many expos I visit. 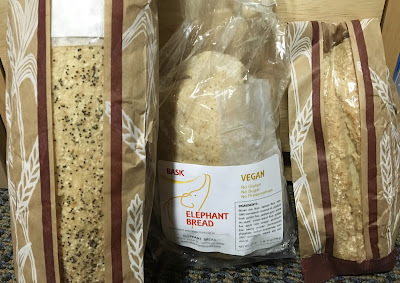 Sourdough bread and baguettes were my favorite foods in the world before I had to go gluten-free, so I made sure to purchase a variety of Elephant Bread's offerings. Note that not all of the offerings are dairy-free or vegan, so make sure to double check before purchasing a loaf. Starting first with the baguette, I loved the sprinkling of poppyseeds that dotted the top. The loaf itself without any toasting or baking had a wonderful crust and deliciously bready and sourdough-like interior. I loved just tearing off sections to dip into tomato soup on a cold day. Long and lean in size, I was thrilled by how "normal" the bread was, and had to restrain myself from eating the whole loaf in one sitting. 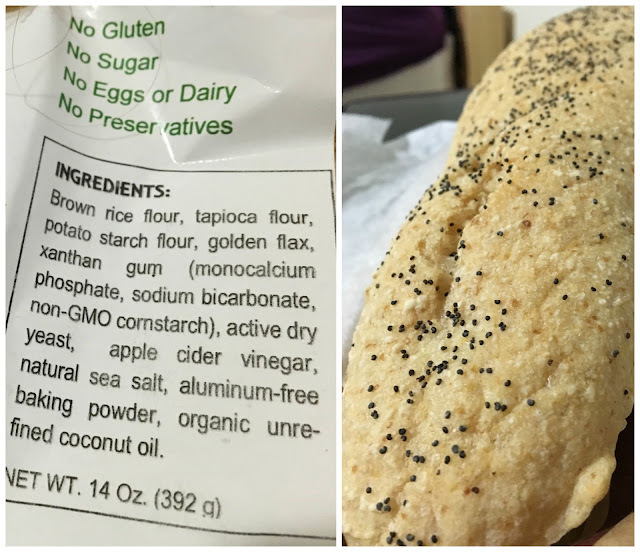 Another loaf I picked up was the vegan loaf, which was the size of sandwich bread- and not the minuscule loaves that are typically associated with gluten-free. This loaf had a bit of a coconut oil taste, which wasn't off-putting but was definitely detectable. I loved this loaf toasted to crispy perfection and slathered with almond butter on top for an effortlessly delicious breakfast. The bread easily rendered 14 thick slices, and froze beautifully after slicing before going in to the freezer. The last loaf I bought was the petite baguette, which totally would make an amazing sub sandwich. Similar to the full size baguette, this one had a nice tough crust that was interestingly textured that surrounded a fluffy, sourdough-like interior. This loaf would be amazing to turn in to garlic bread or a baguette pizza, but I loved it all on its own. 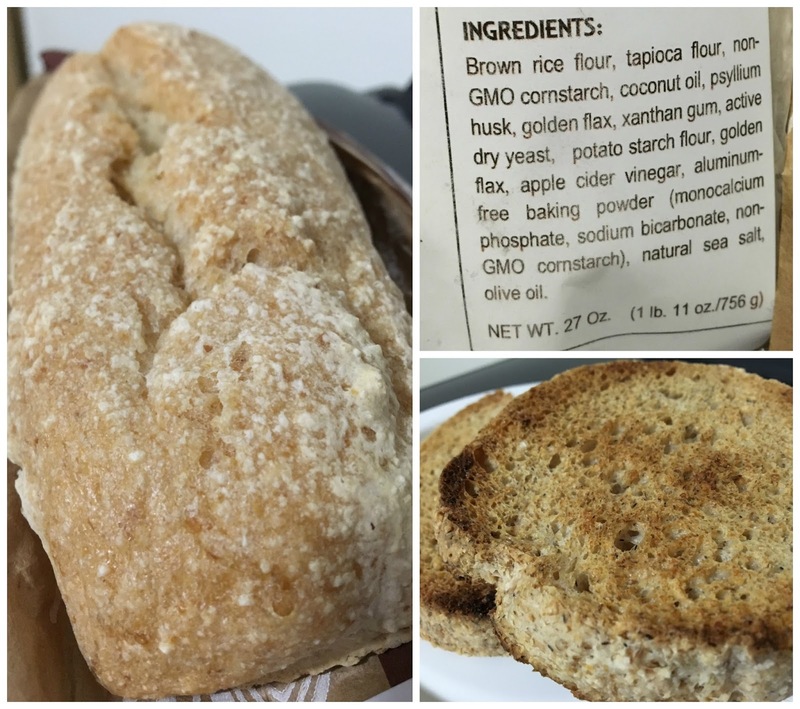 After all, how often can you enjoy an authentic baguette that's both gluten and dairy-free? I've tried many iterations of bread in my time as a gluten-free blogger but Elephant Bread stands out from the pack because of it's authentic taste and texture, quality ingredients, and the clear passion demonstrated by Mary, the woman who pours her heart into every loaf. It's people like her who make all the difference by normalizing simple treats such as gluten-free bread for those who must go without. I look forward to enjoying this bread on my next visit to Cincinnati, and hope they can someday ship their loaves across the country because they are definitely worth it. To find Elephant Bread in and around the Cincinnati area, click here to see a list of places the bread is sold. Below is a quick guide of local restaurants and markets that stock the bread.